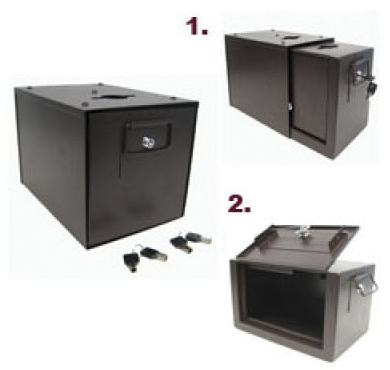 Standard size universal professional casino drop box complete with shield, two cam locks and four keys. This quality steel drop box is easily mounted in the shield on the underside of casino gaming table with five screws and provides a layer of protection for the holding of monies collected (chips and bills) on the various shifts throughout the day. This item offers two different sets of keys. The first set of keys unlocks the drop box from the outer shield. The outer shield is the steel cover that is attached to the underside of the game table and holds the drop box securely. The drop box locks directly into the shield. During the release, the drop box hole closes to ensure against tampering. Chips fall through the universal money drop slot or poker drop slide into the hole in the shield, and finally into the drop box. The second set of keys opens the side door of the drop box and the contents can be removed. The drop box is also sold separately item number 50-0076.